Summer is here and if your kids haven’t ended school yet, they’re probably getting out soon. Then the I-need-to-figure-out-how-to-keep-them-entertained juggle begins. There is also the goal of having their brains not turn to mush during the break from school. So, how does a parent keep their kids entertained, educated and engaged? 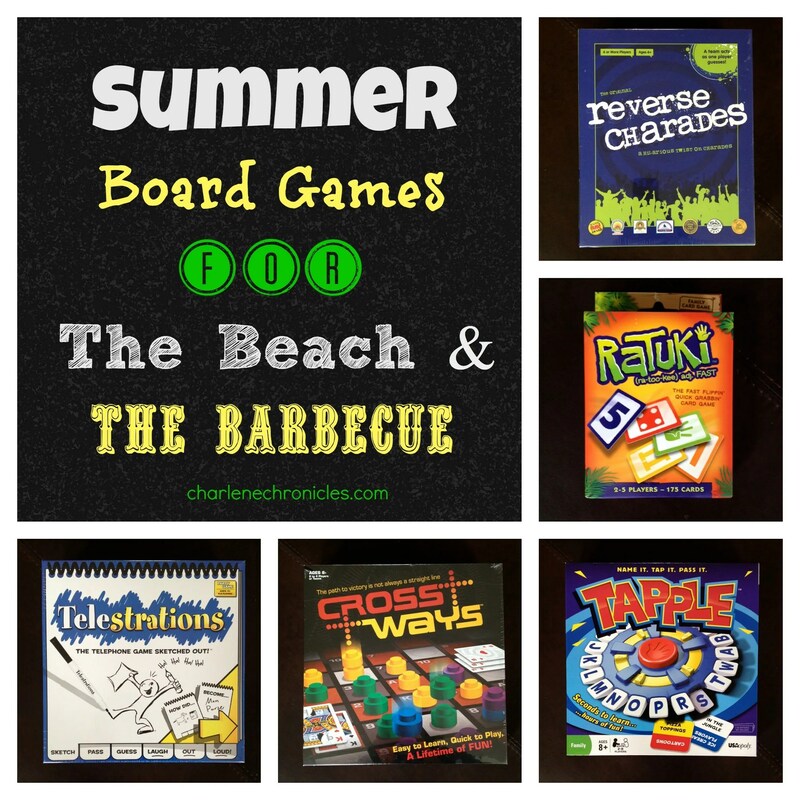 Whether you have a formal game night during the summer, sitting on a patio after a barbecue, or you have Thursday afternoon game tournaments with neighborhood kids and popsicle sticks, summer board games are a fun way to play with your kids and keep them happy, and learning new skills like turn taking, patience, strategy and quick thinking! There are lot of fun games to play; classics like Candyland or Monopoly. However, there are new ones that won’t seem like the same old, same old, and are a lot of fun. Reverse Charades, Tapple, Telestrations, Cross Ways, and Ratuki are five games by USAopoly to check out! The TAPPLE Board Game by USAopoly is a fast paced word game. There is an electronic (note: needs batteries) TAPPLE Wheel and 144 categories on 36 category cards. Parents will love the fact that the cards are stored in the Tapple Wheel! Keeps the game together, organized and ready for a summer vacation trip! Choose a category card and start the timer on the Tapple wheel. In just 10 seconds, name a word matching the category, (e.g. pizza topping: pepperoni), press the first letter of that word on the wheel (P), tap the button to reset the timer, and pass it along. Letters already pressed may not be used again, so the pressure mounts! Can’t think of a word in time, you’re out for the round. The player that collects the most cards wins! Gets kids to think, and think quickly! Ages 8+ and 2-8 players. MSPR $20. CrossWays is a game that encourages you to complete a path across the board to win, but opponents can block your way or remove your markers, so your path across the board may not be in a straight line! You use traditional playing cards with the board. If you get a Queen of Red Diamonds, you can place your marker on the Q red square. If you have a pair of cards, you can score the coveted white spaces. If you get a suit, you can remove an opponent! It is a simple premise, but a fun game of offense, defense and strategy! MSRP is $25 for ages 8+ and 2-4 players. The Ratuki Card Game consists of 5 card decks & no batteries, so it’s super portable to bring with you for a day on the beach! Ratuki (ra-too-kee) means fast in Aymara, an indigenous language spoken in South America, so two to give players simultaneously race to unload their cards by playing on shared stacks. Put a 5 or a wild card on a stack to claim in and collect points. First one to 100 points, wins! Ages 7+. MSRP $12. Reverse Charades is a hilarious twist of charades. You need six or more players for this game, so its perfect for a barbecue or graduation party. Rather than one person acting out a word and a group of people guessing, reverse charades is where a group acts out a word and one person guesses! Imagine getting the card “Rock Band” and having a group act out (or should I say, rock out) for you to guess? Your team has 60 seconds to act out as many words as it can. There are over 700 words and phrases so the game will not get boring any time soon! For kids 6+ and MSRP is $20. Telestrations – The Original is a telephone game (remember those as kids? )….on paper. You sketch, pass the sketch, and guess. For ages 12+ and for 4-8 players. I think is a perfect game for a parents night. Maybe you don’t want to be goofy with Reverse Charades and jump around. This has a similar feel, but you can stay seated with a glass of wine. How you play is to pull a card, like the phrase is Doggie Bag. You draw a dog next to a bag. Then you pass Sketch Book to your friend, who guesses doggie bag, and writes it down. Then passes the Pad to another friend, who sees the doggie bag phrase and has to draw that phrase which looks like a Man holding a bag. You pass it to another friend who guesses purse snatcher, and writes it down and passes it along. You get the phrase purse snatcher and draw a man with a purse and your friends guess Man purse. It is fun to see what the final guess it based on the first drawing! You use reusable sketch books with 6 tabs, so as you draw, you flip the pad to the next page to write your guess, then the next person flips the pad to the next page to draw and so on. The games also comes with a 60 second timer, 8 clean up cloths and 8 dry erase markers. MSRP $30. The last game is Treasure Trax. It is perfect for kids as young at 3+, totally portable. You can see my full review of it here. So whether you are hosting a Labor Day Lunch, a Father’s Day Brunch, many ice cream parties or barbecues, or just a quiet summer night at home with the family, all of these games will bring a lot of fun with family and friends! Enter to win Cross Ways, Telestrations, Reverse Charades, Tapple and Ratuki! Over $100 worth of games to keep you having fun this summer. Simple entry and full rules can be found here! Good Luck! These look like such fun games! Thank you. Tapple and Telestrations sound especially fun!